These performances featured Melissa Pace Tanner, vocalist, and the Salt Lake Jitterbug Club. Swing Music played by the Big Bands of the 1930s has a timeless quality that reminds us of a truly remarkable period in our nation’s history. The Great Depression which devastated the United States in the early 1930s called for progressive forward looking action. President Franklin Roosevelt’s New Deal was just the medicine our nation needed. That same determined action is also what got us through World War II in the next decade. The soundtrack in both cases was Swing Music. When one looks at the architecture and the fashions of that era one is taken by the forward looking, futuristic feel. Hair styles were streamlined like the latest high-speed passenger train. Household appliances looked as though they could fly to the moon! Swing music fit right in. It was upbeat, usually fast and very exciting. It of course could be romantic as well – like the sleek lines of an elegant trans-Atlantic ocean liner. Swing Music enjoyed a huge following. Part of reason for its popularity was the fact that the United States after WW1 experienced its first Baby Boom. The baby boom of 1920-21 was almost as large as the post-WWII boom of 1946-47. These children born at the beginning of the “roaring 20s” decade came of age entering high school during Roosevelt’s New Deal and the birth of Swing Music. 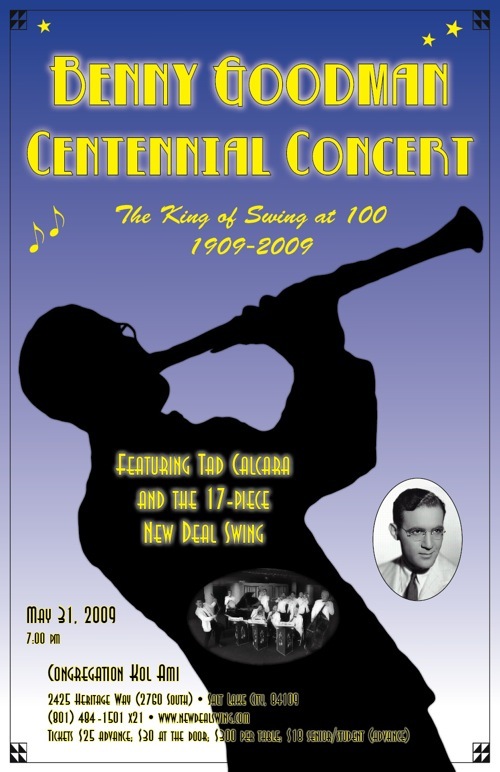 Many regard the famous evening of August 21, 1935 when Benny Goodman played to a capacity audience in Los Angeles’ Palomar Ballroom, to be the start of this new era in American music. Soon theaters and ballrooms across the nation would echo with the hot sounds of Swing Music. Here in Salt Lake City the places to catch the top bands were the Rainbow Rendevous and the Coconut Grove. Soon Swing Music could be heard everywhere: in movies, at stores, restaurants, and of course on radio. Musicians were already playing this type of Jazz-based dance music since the mid 1920s in certain areas of the country. Considered the father of Swing Music, Fletcher Henderson (1897-1952) had been leading his band for nearly 10 years. He eventually accepted a job from Benny Goodman as his chief composer and arranger for his band. Duke Ellington began his celebrated stint at the Cotton Club in New York in December 1927. New York City was a thriving musical center for this new type of dance music. Other bands in New York included those lead by Chick Webb at the Savoy Ballroom; Cab Calloway; Don Redman at Connie’s Inn; and Jimmie Lunceford at the Larchmont Casino. It seemed the country was ready for Swing Music when Benny Goodman made his famous debut in the summer of 1935. This event opened the floodgates for many new bands as well as the established orchestras. Two brothers from northeast Pennsylvania, Tommy & Jimmy Dorsey, split up and each formed their own bands. One of the trombonists of Jimmy Dorsey’s band eventually left to form his own outfit; his name was Glenn Miller. A very fine clarinetist working in the radio studios of NYC eventually formed a group known in 1936 as “Art Shaw & his New Music.” Of course later he became better known as Artie Shaw. An excellent pianist in Kansas City was leading an exciting band at the Reno Club. His name was Count Basie. One of the great highlights of the Swing Era was the famous Benny Goodman concert at Carnegie Hall. The evening of January 16, 1938 was a way of legitimizing Swing music and American Jazz. It was also in a way the coronation of the music’s “king”: Benny Goodman. When listening to Swing Music today, one is taken by the amazing energy and timeless quality of this truly unique style of American music. Fortunately, through performances like ours tonight we can enjoy the amazing sound of the Big Bands live once again, just as it was 70 years ago. OPUS ONE was composed and arranged by Melvin “Sy” Oliver (1910-1987) in 1944 for Tommy Dorsey’s Orchestra. Sy Oliver was a talented trumpet man in the Jimmie Lunceford Orchestra in the 1930s. He was also an amazing composer and arranger. He impressed Tommy Dorsey so much that he was continually making offers to him to join his band! Oliver finally joined in 1940. Many of Dorsey’s hits were either composed and or arranged by Sy Oliver. OPUS ONE from 1944 was one of the big hits of the war years. On the other side of the same record, Sy Oliver arranged a classic standard from the 1930s: ON THE SUNNY SIDE OF THE STREET. Artie Shaw (1910-2004) was until recently the last of the famous band leaders of the era still living. Born in NYC and then growing up in New Heaven, he heard a saxophonist perform in a Vaudeville show that made an impression on the future musician. He was intrigued by how, without the use of language, a person could convey emotions and feelings through music. This became his lifelong ambition. He finally made the Big Time after experimenting with an unorthodox band. An example of the sound of this early band is the composition titled CREAM PUFF of 1936. However in 1938 Shaw was now leading a conventional big band – and hit the jackpot with his version of the Cole Porter tune BEGIN THE BEGUINE. Soon other hits followed: MOONGLOW in 1941, and the beautiful ballade ANY OLD TIME in 1938 – which originally featured vocalist Billie Holiday who sang for a while in Shaw’s band. After a vacation to Mexico, Shaw brought back the soon-to-be-popular melody by Mexican composer Alberto Dominguez, FRENESI of 1940. However, the most lasting impression left on “hep cats” of the 30s who enjoyed “cutting the rug” were pieces like BACK BAY SHUFFLE (1938) which featured many members of his band as well as showcasing his own virtuoso clarinet. Duke Ellington (1899-1974), in addition to being a pianist, band leader, and arranger was one of the most prolific composers of the 20th century – his compositions number over 2000. His has always been regarded as the most sophisticated of the Big Bands – always searching for a more interesting harmony or exquisite melody. Many compositions were inspired by musicians in his band. Sections of ROCKIN’ N’ RHYTHM (1930) were borrowed from clarinetist Barney Bigard. However, it was the genius of Ellington to hear all of these ideas and carefully craft them together into a captivating whole. Another example is his piece IN A MELLOW TONE (1939) in which he turns loose two of his most expressive soloists (Johnny Hodges, sax, and Cootie Williams, trumpet) to play against (and with) the band. The music that Ellington writes almost antagonizes and teases each of the soloists to respond in creative ways. The outcome is an irresistible swing that dancers loved. Benny Goodman (1909-1986) would always say that he would have had a pretty good band if he had not met Fletcher Henderson. But because of his collaboration with Henderson, he had a GREAT band! Fletcher Henderson had the keen sense to take a song and make it swing so naturally. His arrangement of BETWEEN THE DEVIL & THE DEEP BLUE SEA is an excellent example. Soloists and vocalist float over the undulating backgrounds that Henderson composed for the rest of the band. And he created an improvisational feel during the “shout chorus” when the arranger has the opportunity to write a variation on the original melody. Goodman also had other excellent arrangers: saxophonist Jimmy Mundy, who originally played and composed for Earl Hines, wrote the famous SWINGTIME IN THE ROCKIES (1934); and reed man and violinist/composer/arranger Edgar Sampson (1907-196?) gave Goodman a huge hit with STOMPIN’ AT THE SAVOY (1934). Harry James (1916-1983) began leading his famous band in 1939. He was a true virtuoso on the trumpet who worshiped Louis Armstrong. He joined Benny Goodman’s band in 1937. With Goodman he was one of the featured soloists who was quite popular with the crowds. In fact, at the famous Carnegie Hall Concert of 1938 the crowd’s roar of approval of his playing sometimes drowned him out! With Benny Goodman’s blessing (and financial backing) James formed his own band in 1939. It featured many great soloist including two fine vocalists: Helen Forrest, and a kid from Hoboken, NJ named Frank Sinatra. Harry James loved to play hot – but he could also melt hearts with his romantic ballade playing on pieces such as YOU MADE ME LOVE YOU (1941). Ella Fitzgerald (1917-1996). After the famous Carnegie Hall concert with Benny Goodman on January 16, 1938, much of the audience headed up to Harlem to the Savoy Ballroom where another extraordinary event was about to take place: a battle of music between the house band of the Savoy lead by Chick Webb, and a new band from the west led by Count Basie. Seventy years later people who were there still can’t say who actually won – they were both incredible. However, Chick Webb’s band had a secret weapon: her name was Ella Fitzgerald. After coming to the attention of Webb in an Apollo Theater contest (she won the grand prize), the 15-year-old orphan was taken in by Webb and his wife. They eventually adopted her – and she loved going to work with her dad to listen & learn from his extraordinary band. It was like a music conservatory for her to hear the great solists in her dad’s band. After spending three years studying and practicing, Chick Webb invited her to sing with the band when she turned 18. The public went wild over her beautiful style and sense of swing. She never stopped swinging throughout her whole life, and eventually became known as the First Lady of Song. Jimmie Lunceford (1902-1947) lead a very popular band that became known as the “Harlem Express.” He grew up in Denver where he studied music with the head of the music department of the Denver School District: Dr. Wilburforce Whiteman, the father of Paul Whiteman. Lunceford became proficient on many instruments and studied composition. He later graduated from Fisk University in Memphis where he was soon teaching music and athletics in a local high school. He had an extremely talented bunch of students and were soon playing dances around town. Lunceford added a few colleagues from Fisk University (Willie Smith, alto sax, and Edwin Wilcox, piano) to the band and by the time the youngest students graduated, they had a contract to tour. They eventually landed at the Cotton Club in NYC. They had a giant following wherever they performed. It was one of the finest bands of the era which left a huge impression on other musicians. Two bands that were heavily influenced by Jimmie Lunceford were Glenn Miller’s (1904-1944) and Tommy Dorsey’s (1906-1956). Both were impressed by the precision of the Lunceford ensemble and the fine arrangements that were written by several members of the band. In both cases Miller and Dorsey “borrowed” musicians from Lunceford’s band. As mentioned earlier, Dorsey eventually hired Sy Oliver. And Glenn Miller commissioned one of Lunceford’s trombonist, Eddie Durham, for new arrangements for his own band. In fact Miller’s most famous hit was arranged by Durham: IN THE MOOD (1939).